Todays bachelorette party comes to us from our favorite stylist, Christina Joy. 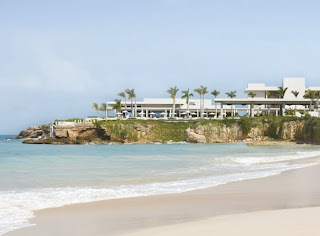 We arrived at The Viceroy Anguilla after a long and arduous journey. It was one plagued by missed planes, stinky taxis and a last minute overnight stay in a less desirable hotel in an even lesser desirable city. It was such a difficult trip that I thought The Viceroy was a mirage at first sight but fortunately, I was wrong. It was an oasis of chic set against a backdrop of blue sky, white sand and turquoise water. To say The Viceroy is a vision is an understatement even for a perfectionist like me. As a stylist I edit and build wardrobe and interior collections. Not to mention I spent my former career life as an art director and designer. Needless to say, my discerning eye is all too quick to point out flaws. But at The Viceroy I was pleasantly surprised and then thrilled. Upon entering the main building we were greeted with an iced cold refreshment. We proceeded to walk through the open breezeway of a lobby that was warm and welcoming although as sleek and sophisticated as the hotel interiors back in New York. Quite the opposite of what you typically expect from a Caribbean resort. Designed by Kelly Wearstler, the property is adorned with curvaceous furniture in moody dark hues and rich creamy ivories glossed to perfection and accessorized with African wood, shagreen, rock crystal and bronze sculptures. 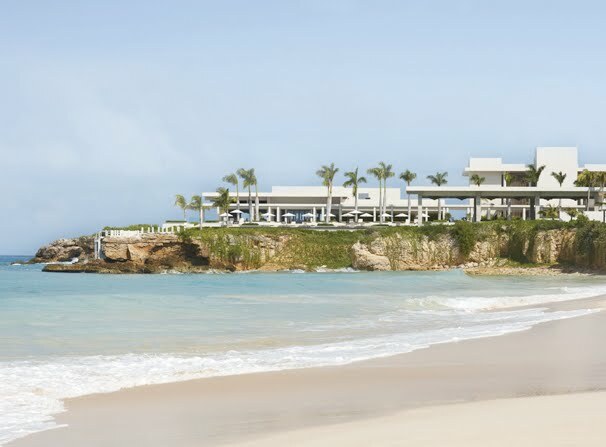 A feast for the eyes, style and design reign supreme at The Viceroy Anguilla. Exiting the breezeway we encountered lush green grass, tall palm trees and boxwood hedges in geometric patterns so inviting that you inch forward to explore the whole property. It’s alluring. Walking further we found the beautiful and impressive Sunset Lounge encased in marble and travertine overlooking Barnes Bay and beach. It’s an outdoor living room with lounge beds and deep cushioned seating as elegant as it is comfortable and relaxed. One could spend all day camped there with a good read. Go to the edge and down two steps to enter the most serene infinity pool with an unmatched view of the stunning sunset each evening. Off to the left and beneath the cliffs lies a path of majestic villas that leads to The Half Shell Beach on Barnes Bay. It’s a hideaway, home to a beautifully outfitted bar and grill perfect for spending a quiet afternoon by the water. It’s also the stretch of beach where we watched local fisherman casting their nets for the catch of the day. The Viceroy opens to an expansive complex. Meander around a corner or two and there’s another pool dotted with palm trees surrounded by partially open, fanned cabanas that provide shelter from the unforgiving sun. Climb down the rocky stairs to a cove so sublime it feels like your own personal blue lagoon. It’s actually an inlet of Meads Bay, arguably one of the most beautiful and peaceful beaches in the Caribbean. local specialties to perfection and bursting with flavor. Our favorites were the sand crab, the joya bread salad and the jerk chicken. We also enjoyed sampling the island cocktails especially the Rum Punch, the Painkiller or any of Janice’s secret potions. Truly fine service is also in style at The Viceroy. Once you adjust to the Caribbean time delay (meaning everything moves a bit slower) you’ll find there isn’t a task too small or too large for The Viceroy staff to tend to with a smile. The resort has some of the most polite, cordial and helpful individuals I've ever encountered throughout my travels. I attribute that to the nature of the Anguillan people. The friendly vibe was property wide from the groundskeepers to the housekeepers. 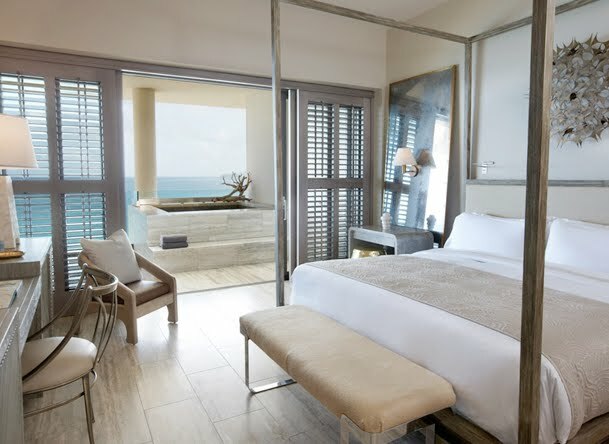 So while style and design reign supreme at The Viceroy, it’s clear that service is paramount as well. Back to style. Simply said, our room was the type one would wish to live in forever. This is perhaps the greatest compliment one can pay any designer. It was chock full of beautiful fixtures, finishes and amenities including a canopied king bed, flat screen TVs, an ipod dock, a terrace with a large hot tub, a spacious living room, a kitchenette complete with a Nespresso machine, the most spacious double-sink marble bath with a tub for two and a shower for six. It was truly beautiful, comfortable and yet functional. All of the accoutrements were conducive to making our stay and routine pleasurable. down after a day of play at the beach. Each thoughtful touch had a role in producing an amazing experience. We didn’t want to leave. In fact, we extended our stay twice spending nearly 2 weeks at The Viceroy Anguilla. For these reasons and many more, I truly found joy at The Viceroy. I can’t wait to return! Viceroy is truly a beautiful resort. Thanks for sharing the photos.